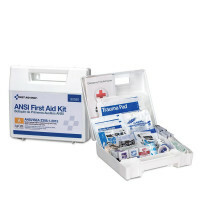 Most businesses need to meet or exceed ANSI First Aid Kit requirements - OSHA regulations most often start with these as minimum requirements - and then in some cases build up from there for industry-specific needs. 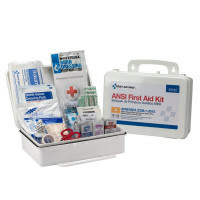 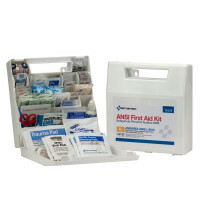 These ANSI First Aid Kits and ANSI First Aid Kit Refills and Upgrade Packs will assure your ANSI compliance. 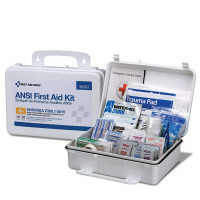 The American National Standards Institute publishes minimum standards of quality for many items related to safety. 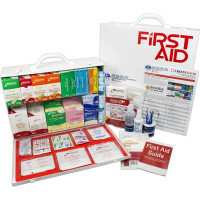 Do they have a minimum content requirement for first aid? 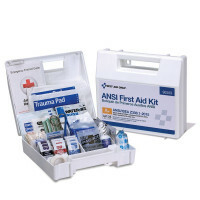 Yes, to be ANSI compliant a first aid kit must have the required minimum fill according to standard ISEA / ANSI Z308.1-2015. 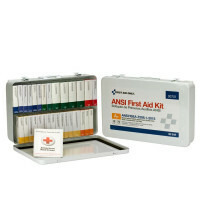 No, BUT there are more than 20 states that have adopted ANSI standards as their state recommended requirements. 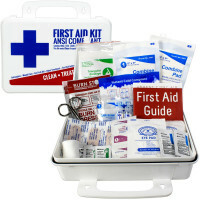 OSHA requires adequate first aid supplies to be available in the workplace but they don't require any specific contents. 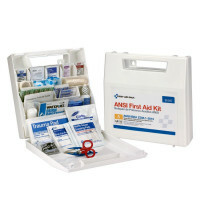 By recommending a specific fill, one will be guaranteed to find necessary items in an ANSI kit. 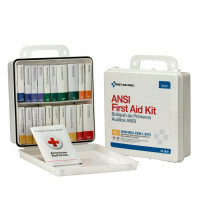 Does ANSI affect unitized colors? 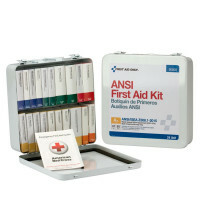 Yes, one of the most important parts of ANSI Z308.1-2015 is the standardization of colors on unitized refills. 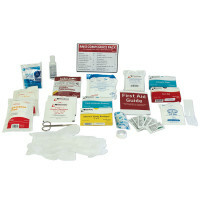 Bandages, Antiseptics, Burn Treatment, PPE and Miscellaneous items will each have their own color. 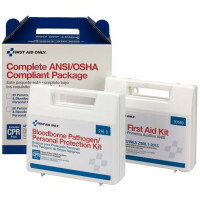 This standardization will make it easy to recognize product quickly in an emergency. 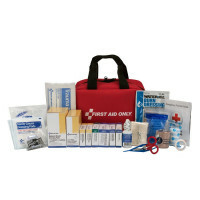 ISEA is the trade association for manufacturers of industrial first aid kits and supplies. 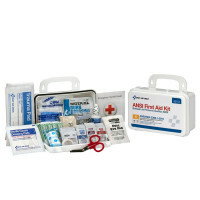 Members of the group manufacture and market a full range of first aid kits and supplies, designed to meet user needs for a wide range of applications. 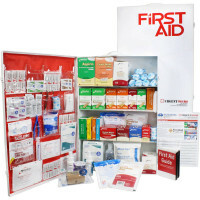 ISEA members have a seat at the table when standards are being written that affect their products; they get a first look at changes in standards, they influence the development of new standards, and they are kept informed of developments on standards around the world. 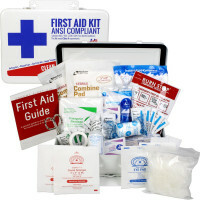 ISEA is the secretariat for the American National Standard for first aid kits and supplies, ANSI/ISEA Z308.1, and managed the process by which a broad-based consensus group was brought together to prepare the expanded 2014 edition which was then revised again with a few more changes and published as the 2015 standard. 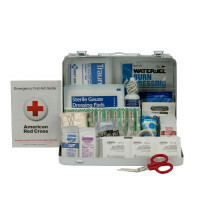 ISEA gives members a full-time Washington office. 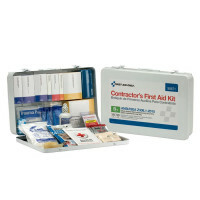 They are kept up to date on important developments affecting their companies, and are identified with a respected and responsible organization that is an advocate for product standards and worker safety. 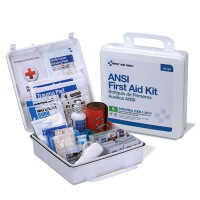 ISEA has worked with OSHA to gain recognition of the ANIS/ISEA first aid kit standard as a guideline for the workplace. 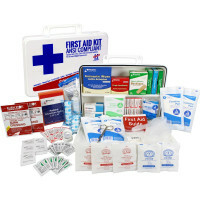 When authorities propose regulations that affect first aid kits or their contents, ISEA keeps members informed and ensures that their views are well represented in agency deliberations. 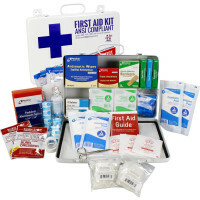 ISEA members use the association to learn from each other, and work together to improve markets. 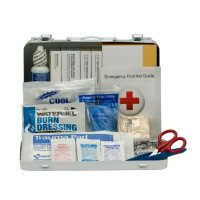 Information services are tuned to member companies’ needs. 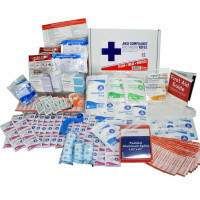 In addition to bringing companies together in the First Aid Group, ISEA membership is a link to the larger world of safety equipment, both in the US and around the world. 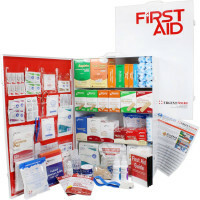 Companies receive regular bulletins and reports on standards, government policies and proposals, and market intelligence. 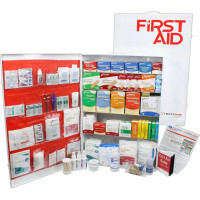 They participate in the association’s Annual and Fall Meetings, where the industry comes together to share information and insight. 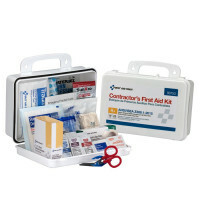 Members’ products are listed in a Buyers Guide, published in print and in a searchable on-line database. 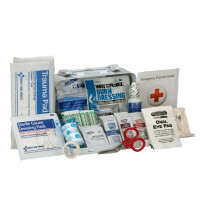 For more than 75 years, ISEA has set the standard for personal safety equipment manufacturers, supporting and promoting the business interests of its member companies, united in the goal of protecting the health and safety of people worldwide. 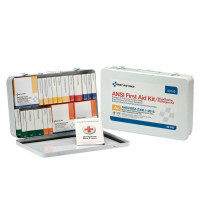 This standard, a revision to the 1998, 2003, and 2009 editions, was prepared by the members of ISEA’s Industrial First Aid Group, in conjunction with leading industry stakeholders and was reviewed by a consensus panel of users, health and safety professionals, and government agencies. 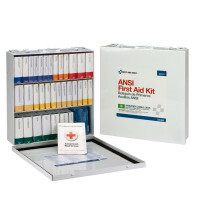 The International Safety Equipment Association (ISEA), in conjunction with leading industry stakeholders, developed this standard in 2014, updating and expanding ANSI/ISEA Z308.1-2009. 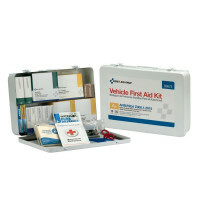 A subsequent revision in 2015 corrected a minor technical revision to the 2014 edition. 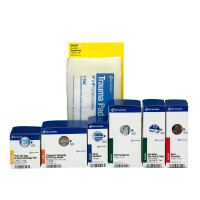 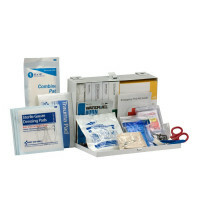 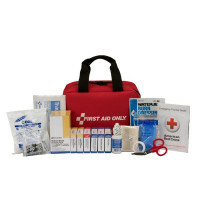 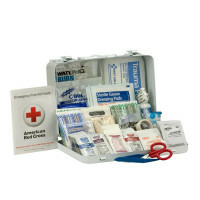 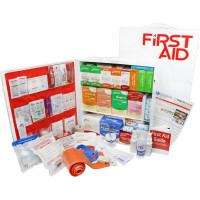 The standard classifies first aid kits based on the assortment and quantity of first aid supplies intended to deal with most types of injuries and sudden illnesses encountered in the workplace including: major wounds, minor wounds (cuts and abrasions), minor burns, sprains and strains, and eye injuries. 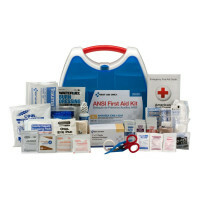 This revision Introduced two classes of first aid kits: Class A kits with contents designed to deal with most common types of workplace injuries, and Class B kits with a broader range and quantity of supplies to deal with injuries in more complex or high-risk environments. 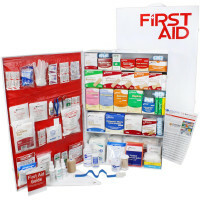 By expanding the items in a basic first aid kit, employees will have greater access to items needed to treat common workplace injuries. 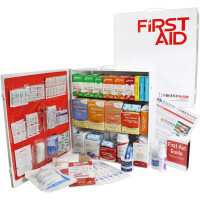 Significant updates incorporated into this version of the standard include the designation of new kit types, expansion of the required supply list beyond the 2009 additions of a first aid guide, to include several new items, and redesignating many of the first aid supplies previously identified as being "recommendations" in the 2009 standard as now being "required" for both newly-designated kit types, and a redesign of the product labeling required. 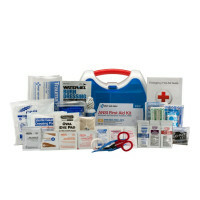 In addition, scissors are to be included in both classes of kits and a splint and a tourniquet are both required for a Class B first aid kit. 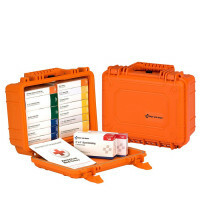 In deciding which class of kit is more appropriate for a given workplace... employers should consider the risks and task load of the work environment and the potential severity and likelihood of occurrence of an injury. 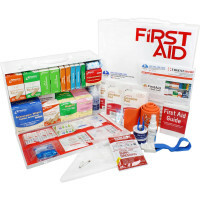 Employers should also consider whether multiple first aid kits are needed, based on the number of employees, physical layout of the work environment, and the remoteness of the worksite to emergency services. 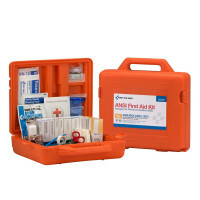 These same considerations can be taken into account when determining if a first aid kit should be augmented with additional supplies.